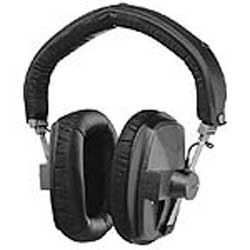 This is a genuine money saving offer on the famous Beyer DT150 monitoring headphones used by virtually all radio stations and studios. The DT-150 are often preferred over the slightly cheaper DT-100, because of their 'smoother' frequency response, including a more rounded bass. Every component on the DT 150 (as on the DT 100) is replaceable as a spare part, so they never even have to wear out! These are brand new, 250 ohm impedance DT150 boxed stock including lead with stereo jack plug and will cost you only £123.99 including VAT and standard UK delivery!